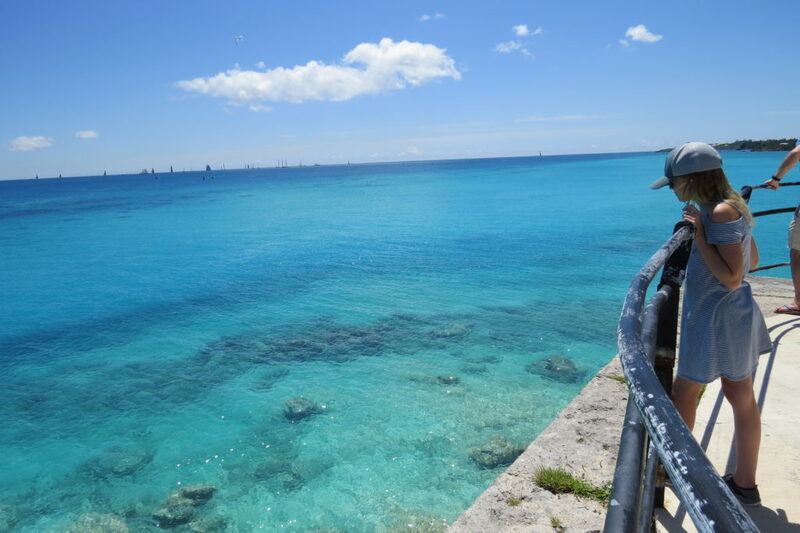 When most people conjure up a mental image of Bermuda, they certainly envision fabulous pink and white beaches, azure blue waters, businessmen dressed in nappy shorts, and, invariably, couples. While the island, still officially a British Overseas Territory, is a fantastic haven for couples and romance, it’s also incredibly family-friendly. To start, the island is exceptionally accessible, with direct flights that are under three hours long from several east coast hubs (and even direct flights from London). Further, the island is absolutely rife with history, culture, active adventures, shopping, golf, virtually any water sport – really a full panoply of what any family could ever want in a destination. My daughter Lillian (age 12) and I started out exploring our immediate environment by heading to the hotel pool at the Fairmont Southampton. There were a number of families there; parents enjoying the poolside sun and table service, while little ones and teens enjoyed the actual pool. We later realized we should have immediately taken the Fairmont’s free shuttle to their private beach on Horseshoe Bay. It is truly stunning and apparently one of the most photographed beaches on an island known for stunning beaches (and ranked the world’s #8 best beach by TripAdvisor). The public side of Horseshoe Bay Beach includes a concession stand, boogie board and wakeboard rentals, snorkeling gear, and kayaks and SUPs for rent. You and your family can be as active as you want here – or, on the contrary, be totally inert sand-flopping sun sponges. The next day, we set out to really explore the island. We stopped at a local perfumery that not only creates fresh, modern scents based on the island’s flora, but also recently recreated a scent from a still sealed bottle of perfume from the 1800’s that had been found in a shipwreck. From there, we explored Fort St. Catherine, one of 90 forts, large and small, that surround this once geographically strategic stronghold (but yet only three shots were ever fired in anger from any of them – and all three missed the Spanish galleon that was their target). Any kid, be they preschooler or teen, will have fun roaming the walls, installations, and exhibits within this extensive fort, which was first built in the 1600’s. Leaving the fort, we hoped on bikes for a gorgeous ride into the town of St. Georges, a UNESCO World Heritage Site and the earliest English urban settlement in the New World (having been continuously occupied since 1612). We road the winding narrow streets past pastel-painted homes on one side, gorgeous blue waters on the other. While we took the road for this ride, there’s also the 18-mile The Bermuda Rail Trail National Park which spans the island from end to end. 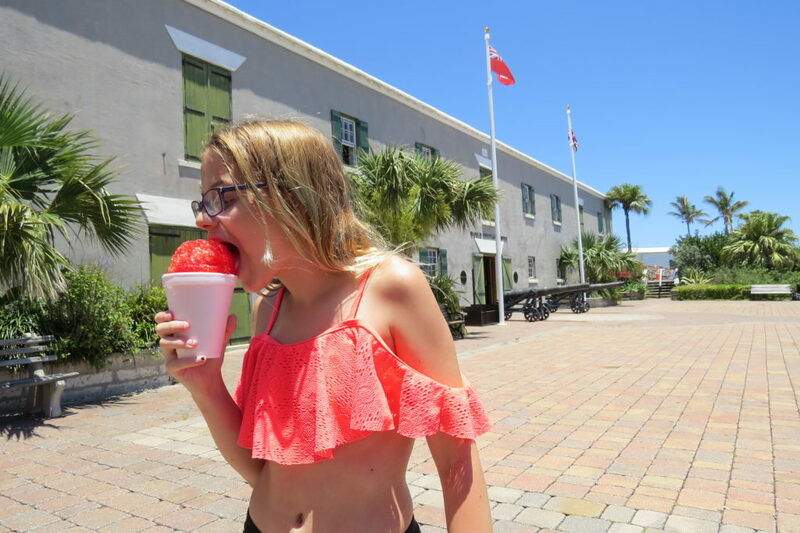 St. Georges was the perfect spot for a refreshing snow cone before setting out for lunch at Gombey’s, an absolutely classic and energetic open-air bar with music, dancing, immediate access to a pristine bay beach, and plenty of oceanic toys. Lillian and I took a water trike for a ride into the bay while others enjoyed leisurely kayaks and stand up paddleboards as descending airliners passed over us toward their landings at the airport. For dinner that night, downtown Hamilton offered plenty of elegant dining options, as well a numerous open-air spots for a sundown beverage. One activity highly recommended for any Bermuda visitor would be to charter a catamaran. It’s a fantastic way to see the island, both from its interior bay and from the open ocean. Further, the catamaran can take you to all sorts of untrammeled spots, places the average visitor might not go. Ask your captain to take you to great snorkeling areas or to the often empty ‘NASA Beach’ at the site of a former site for the space agency. For an unexpected adventure, take the kids underground to The Crystal Caves of Bermuda. Step out of the sun to explore Crystal and Fantasy Caves where you’ll witness deep, clear underground pools and incredible cave formations like chandelier clusters and delicate ‘soda straws’. 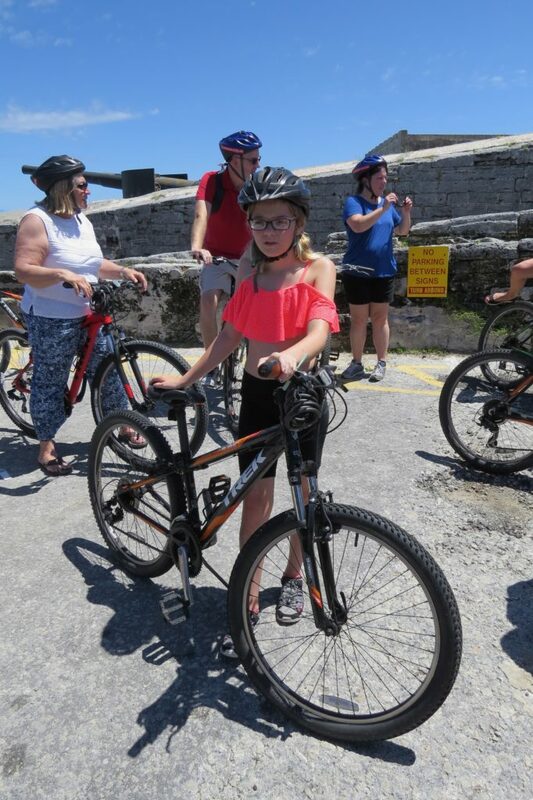 An absolute must for families is the Royal Naval Dockyard, established by the British Royal Navy after defeat in the American Revolutionary War left Britain without a secure operational base between Nova Scotia and the West Indies. Here you’ll find a slew of shopping and dining options among the buildings that once housed Royal Marines preparing to attack Washington D.C. in the War of 1812, repair facilities for ships damaged in both World Wars, and a welcome harbor for generations of NATO vessels. Within the Royal Naval Dockyard is the National Museum of Bermuda, housed in – naturally – an old fort (Bermuda’s largest one) called the Keep. The 16-acre property is a historical artifact in itself but also includes exhibits on treasures from the more than 300 shipwrecks around the island, a German U-Boat captured during World War II, a history of tourism, and much more. Admission for children under 16 is free and the Museum playground includes a discovery sand pit, a 21-ft lighthouse slide, seaweed-like climbing elements, and a 70-ft green moray eel. Lillian excitedly told me that the playground was ranked 8th best in the world online (and I really couldn’t challenge her on that one). Also located on the grounds is the squeal-producing Dolphin Quest where you can swim with dolphins. 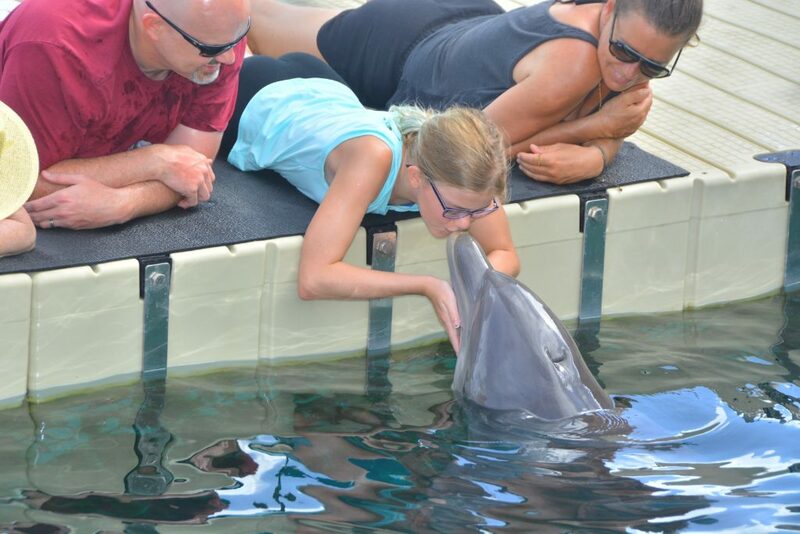 Lillian’s absolute highlight of the trip was getting to kiss a dolphin on the snoot. Dr. Jay Sweeney and Dr. Rae Stone, veterinarians specializing in marine mammal care, founded dolphin Quest in 1984. With such an array of fantastic stories, adventurous activities, posh and elegant comforts, and kid-friendly culture, Bermuda is a must-go destination for any family. 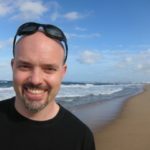 Chris ‘Chez’ Chesak is Executive Director of the Family Travel Association and a 15-year veteran of the travel industry. While he’s lived all over the U.S. and traveled to nearly 30 countries, he has the most fun when he’s exploring with his wife Sally, and three daughters. An avid outdoors person and writer, he’s happiest on a trail, on skis, or nestled into a sleeping bag. And he’s decided that another, longer, trip to Bermuda needs to be a priority on his family’s trip list. I have lived in Bermuda for 36 years. Have always drunk the tap water and the ice cubes made from it. Never heard such nonsense about the local water. It is cleaner than pipes water in cities like New York or London.